After another incredible season of racing, it’s time for the grand finale of the 2018 FIM CEV Repsol, to be held at the Circuit Ricardo Tormo on the 24th and 25th November. The Junior Talent Team of Yuki Kunii, Ai Ogura, Tom Booth-Amos and Gerry Salim welcome newcomer and Idemitsu Asia Talent Cup alumnus Tachakorn Buarsi to the fold for the last weekend of the season - with the Thai rider replacing compatriot Somkiat Chantra, who heads off the begin testing for his new adventure in Moto2™. As we begin the weekend, Kunii is the man in the driving seat in the standings. Taking a first win this year and putting together a consistent campaign, the Japanese rider is currently third overall and only 17 points adrift of second – more than simply a possibility given there are 50 points still on the table over two races. And on the first visit to Valencia this season, Kunii had two solid finishes. Ogura was another who took a good finish last time at the Circuit Ricardo Tormo, getting on the podium in Race 2 – so he’ll be pushing hard to repeat that and makes gains up from his current P6 overall. Tom Booth-Amos, meanwhile, was injured in Valencia last time round. But he took his best finish yet in Albacete, in the top five now he’s back to full fitness, and will be aiming for more of the same and another big points haul to finish the year. 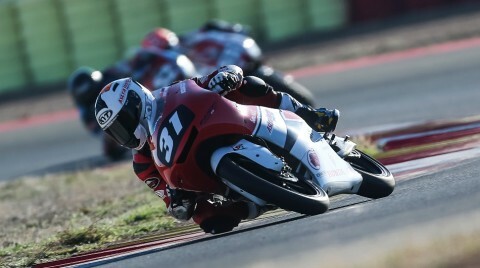 For Gerry Salim, points are also the target – with Salim having scored for the first time at Albacete. Buarsi will also be eager to score on his debut in the FIM CEV Repsol as well, having been a solid improver throughout the Asia Talent Cup season and taking his first podium in the season finale at Sepang. The bowl-shaped stage in which the Circuit Ricardo Tormo nestles is a unique one for the season. How much will our first visit to the track preview the season finale? All will be revealed this weekend, with the final two races on the season on Sunday 25th November. Race 1 begins at 11:00 (GMT +1), before Race 2 closes out the season from 14:00.